Excerpt from U.S. Coast Guard “Proceedings of the Marine Safety & Security Council” magazine. By Mr. Ben Thomason, program analyst, CACI Corporation. 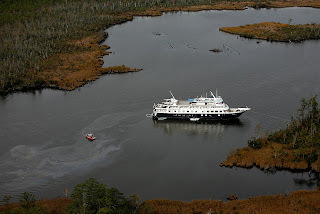 At 5:30 a.m. on Nov. 8, 2007, the Spirit of Nantucket struck a submerged object while cruising from Alexandria, Va., to Charleston, S.C., and began taking on water in the Intracoastal Waterway near Pungo, Va. To stabilize the situation, the captain elected to ground the vessel. In the photo, the vessel sits in the Intracoastal Waterway after being run aground. briefed members of the Virginia Maritime Association and Virginia Port Authority of potential maritime transportation system issues. During the post-incident hotwash, several interagency players commented that the operation almost seemed scripted, reminiscent of previous exercises. The sector’s relationship building within the maritime community had promoted a cooperative spirit and a level of trust that fast-tracked vessel recovery and NAVHAZ removal.